Pansies & Tuberous Begonias on Sale! Another great weekend of seeing new and old faces visit the greenhouse. We still have a good supply of baskets, bedding plants and many veggies. Pansies and tuberous begonias are on sale - buy one get one free so come on over and stock up on quality plants at affordable prices. WOW, what a weekend that was. We had folks from Burlington, Montgomery, Johnson, Corinth, Newport and even a few came from Switzerland to visit Stillmeadow Gardens. Thank you for the nice comments and your patronage. We look forward to the rest of the season and the visits that you make to the greenhouse. We are still transplanting some things and the tomatoes grow a little every day so they will be ready to go in the garden after that last frost date in a few weeks. 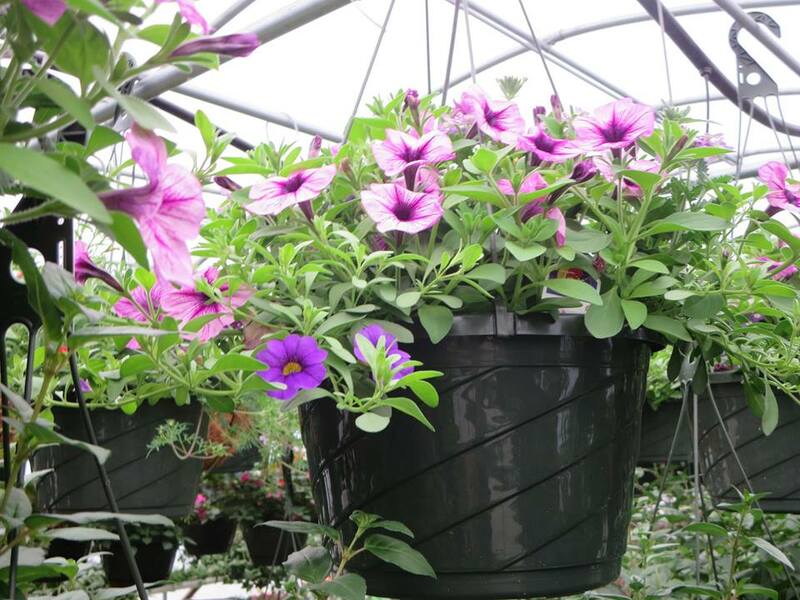 Still many baskets to choose from and lots of annuals and perennials to choose from as well. AND planting continues ---- over 1400 geraniums, 400 plus hanging baskets, many trays of peppers and seeds going in the ground keep us pretty busy these days. Oh please dear weather gods, take us quickly to this spot in the year 2015. Stillmeadow Farm on a great fall day. Love the way the sun shines on the leaves!! A huge thank you to Cori Jean Sanders for her great work creating this amazing new farm sign for us. Amazing talent --- thanks again Cori. So many great comments on your talent today.